Spread out your pie dough. Using a 3-4" round cookie cutter, make as many circles from each piecrust as possible. You should end up with at least 4 to 5. In the center of each circle, place a teaspoon of cranberry sauce and brie cheese. Fold into a half-moon shape and gently seal the edges. With a floured fork, make creases along the edges to reinforce the closing. Place on a greased cookie sheet and repeat. Beat the egg to create an egg wash. Once all your empanadas have been assembled, using a pastry brush, coat each empanada with the egg wash.
Bake for approximately 18 minutes or until the dough is golden brown. Serve warm. Keep a small amount of flour on hand in which to dip your fork as you crease the edges of your empanadas. Sophistication and comfort never tasted so good! With the tangy and tart flavor combination of cranberry and brie, these empanadas will soon become a household favorite. You can make the quick version of this recipe with store-bought cranberry sauce, or get creative and customize it with a homemade version. The smooth, creamy texture of the brie will melt into the chunky cranberry sauce, and when it’s all wrapped in crispy dough you’ll have an appetizer not soon forgotten. 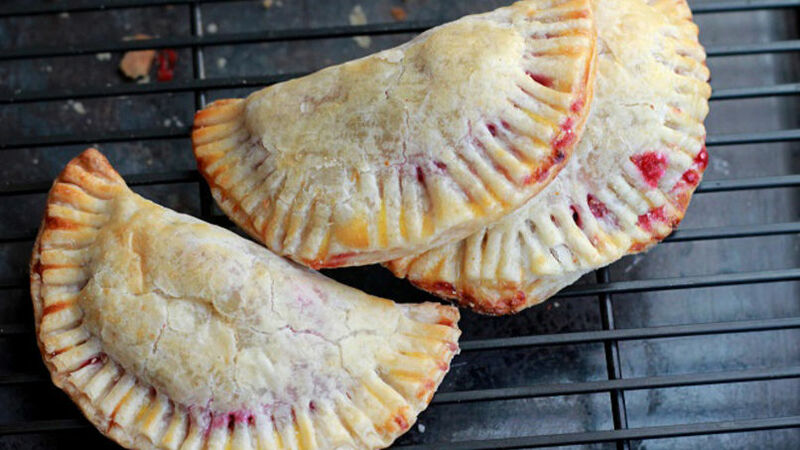 You can also enjoy these cranberry brie empanadas as a breakfast treat or dessert. Simply warm them up and enjoy!